The journey to Umueri, the proposed site of the Umueri Airport City Project was a smooth one for this reporter, until the sign board announced entry into the project site, then the task of moving into the vast land that will house the airport started, and the journey ceased to be smooth. 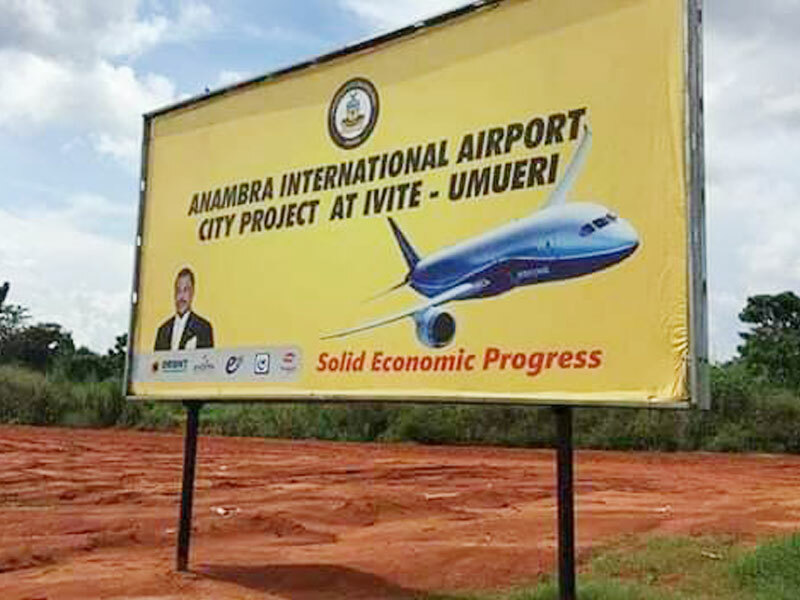 Two years back, during the flag-off of the project, Anambra Governor, Willie Obiano had boasted that the project was far beyond just an airport. He announced that the project was an aerodrome (an airport city project), which asides seeing to the touching down of flights from all over Nigeria and beyond, would also provide services like maintenance of airplanes; which is a rare service, while the deep oil reserve in Aguleri Otu community, where Orient Petroleum Company is domiciled, would offer services like refueling of aircrafts. An engineer, Mr Joshua Nkemdiche, who had spoken to our correspondent in 2017, after the flag-off of the project said: “This is what it means to have foresight. What Governor Willie Obiano is about to do for his state is such that Anambra would be a reference point for anyone who travels by air, and for every airline in Nigeria. Before takeoff from any airport in Nigeria, planes that are taking off in airports where there is shortage of aviation fuel can just fly down to Anambra airport and refuel their planes. “If they notice any fault in the planes, they can also fly down to Anambra and have their aircraft checked before they continue their journey. What Obiano will do with this project is to put Anambra in the map as far as Aviation industry is concerned”. True to Nkemdiche’s words, Obiano during the flag-off, reading from a prepared speech said, “Three years into my first term in office, I stand before you today to answer the call of history. In Christian numerology, the number three is the number of perfect manifestation. So, three years into my administration, the Lord God Almighty has given us a new vision and a new song! Umu nnem (my siblings), our elders say that na Ugo gbuzuo, ochakee! Anambra State has finally hit the bend in the river and our famous can-do spirit has now taken over! “From now on, we have nothing more to fear! Nothing! Not even ourselves! Ndi Anambra, when I took over the reins of leadership of this great state three years ago, I delivered an inaugural address titled – Expanding the Frontiers of Excellence. The historic ceremony we have gathered to perform here today is a very important step in expanding the frontiers of excellence in Anambra State! Indeed, it is important to note that my team and I have gotten a few things right in the past three years. Against all expectations and at a time of great economic recession, we have established our beloved state as a compelling investment destination and attracted investments valued at over 5 billion US Dollars. And with this airport city project, the figure now stands at 7.2 billion US Dollars. “What we are flagging off today is an Airport City Project with a model that will accommodate an airport with two runways, an aviation fuel dump, an airport hotel, an industrial business park, an international convention centre, as well as a facility for aircraft maintenance. The Umueri Airport City Project is conceived to join some of the most advanced airports in the world with a capacity to land any of the most sophisticated vessels known to man today. On the cost he said the project is estimated to cost over 2 billion US Dollars. 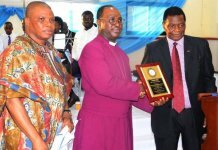 He said: “It is a partnership between the Government of Anambra State, Orient Petroleum Resources Limited and Elite International Investments Limited (Sinoking Enterprises Limited). “Under the contractual agreement, Elite International Investments Limited will provide all the funds needed for the project under the Build-Operate-Manage-and-Transfer arrangement. However under the same SPV arrangement, the Anambra Airport City Infrastructure Limited has allocated 75 per cent equity stake to Elite International Investments Limited, 20 per cent to Orient Petroleum Resources Limited and five per cent to the Government of Anambra State. 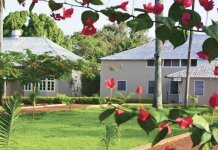 “The host communities are entitled to three per cent of the profit from this project in perpetuity as a part of the standard corporate social responsibility. Indeed, the economic benefits of the Umueri Airport City Project are enormous. Obiano further said the project is expected to generate 1,200 direct jobs and 3,600 indirect jobs, just as he expressed confidence that Anambra indigenes would grab 70 per cent of those jobs in continuation of his efforts to create wealth and prosperity for the people. The governor said the project would also provide an opportunity for training and skills transfer to the people of the state. He added that, “I have no doubts whatsoever that this project will have a tremendous impact on the ease of doing business in Anambra State as it opens a direct access by air to our vast markets. In particular, I hope that on completion, the Umueri Airport City Project will wipe out the difficulties our businessmen and women often encounter in exporting and importing goods and services and help in improving the entire supply chain. Ladies and gentlemen, with this project and our subsequent plan for a light rail project, Anambra State will eventually assume its rightful place as a major commercial and industrial hub in the West African sub-region. “As you are aware, my administration is intensely focused on building projects that have immense economic values. That is why we have concentrated efforts in building roads and bridges that either lead to industrial clusters or the oilfields or the agricultural belt of the state. This Airport City Project follows the same trajectory. That is why we have established a strong synergy between Orient Petroleum Resources Plc and the airport project with a view to operating an Aviation Fuel Segment that will attract both local and foreign airlines to refuel their aircraft in Umueri. The governor’s speech was a well delivered one, but shortly after the flagging off, opposition parties in the state went to work, tackling him on all fronts. In the heat of the 2017 governorship election, when Obiano was fighting for reelection, the candidate of the United Progressives Party (UPP), Mr Osita Chidoka who was an aviation minister and considered to have a good knowledge of aviation system dismissed the project as a white elephant project. 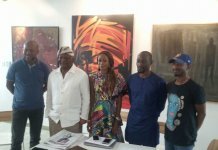 Also, the All Progressives Congress(APC) speaking through the coordinator of youth affairs, Arinze Igboeli, described the project as a political one meant to attract votes in the then election. Igboeli further alleged that the Chinese company handling the project; Sinoking Enterprises Investment Ltd, was a fake company that ceased to exist many years back. He insisted during a press conference that the airport city project was a fluke. He said the airport project needed basic infrastructure, which was necessary to enable the facility grow according to the forces of market. “The basic infrastructure we have to put in place is the runway and landing gear. I will ask the private sector to come and build cargo sections and when I finish, I will ensure that the airport grows naturally at no cost to the state administration. The whole passenger flow in Nigeria’s airport is between five and six million passengers annually. What will be the share of Anambra from that traffic? “Heathrow Airport grew from terminal one to terminal two and now terminal five. There is no traffic study for the proposed airport; no passengers data too. They said it will be a cargo airport and fuel dump. Where is the fuel and refining capacity for Jet A1 here? Let us come down from this high horse. There is no five-star hotel in the whole of South-east zone because the economy has not supported it. Why telling us then that you want to build a five-star hotel in Umueri Airport?” Chidoka questioned. Obiano while speaking at a governorship debate organised by Channels Television however remained defiant; stating that because neighbouring states; Enugu and Delta have airports does not stop Anambra from having one. He maintained that the traffic in Enugu and Asaba Airports were occasioned by the large number of travelers from Anambra who patronise the airports. He stated that what was even more beautiful about the Umueri Airport Project was that it was being financed 75 per cent by a Chinese company, allaying the fears of people like Chidoka who were complaining about the cost. The project which has a completion deadline of 36 months, is expected to be ready by April next year(2020). During a visit to the airport to ascertain the level of work, THISDAY found out that not much has been done on the site. Besides the initial clearing of the 1,500 hectares of land during the flag off, the project has remained the same, and now overgrown by bushes, just as herdsmen also found it a fertile place for their herds to graze. Also, a big portion of the land has been dealt a serious blow by erosion, just as access road into the project from Nteje – Umueri road is almost being cut off by a gully, which developed as a result of persistent rainfall. The access road into the project from Nsugbe flank, where the project spanned is not different as attempt by this reporter to drive through the road, which was awarded in 2015, into the project proved difficult. Though the road was initially wide and pliable, as one drove in, the road became narrower, and later turned into a foot part that could only be accessed on foot, just as erosion had equally threatened it. Attempt to reach the state commissioner for works, Mr Marcel Ifejiofor was however not successful, as his telephone line remained unreachable. An email sent to the Chinese company handling the project, Sinoking Enterprises Limited, seeking to know what went wrong in the once hopeful partnership was also not responded to after one week. Chinese Ambassador to Nigeria, Dr Zou Pingjian at the Governor’s lodge, Awka, Anambra State, Obiano was said to have discussed with him the need to facilitate the building of the aerotropolis, which he said had suffered much delay. Meanwhile, Anambra people, whose hopes were raised during the flag off of the project have started reacting to the delay. An indigene, Nzeadachie Anaedo in his reaction said, “I have been involved in EIAs, Geotech and Geophysical tests of many large projects. A rainy season and a dry season have passed since the commencement of the airport project and that’s enough for the project.